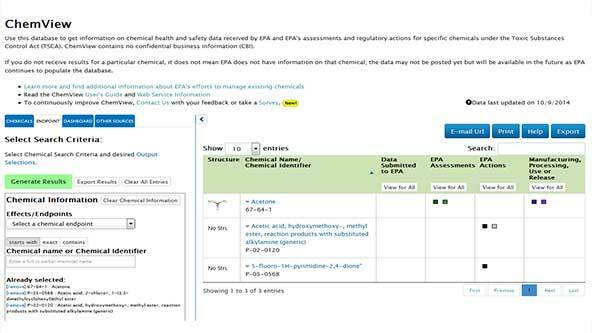 The EPA announced last week that it has made improvements to its ChemView Tool, a public facing database of regulatory information for chemicals covered by the Toxic Substances Control Act (TSCA). According to the agency’s press release, the update includes improved information around Chemical Data Reporting, pollution prevention, consent orders, test rule data, and the Safer Chemicals Ingredient List. The TSCA is an act that gives the EPA the ability to regulate new commercial chemicals before they enter the market and existing chemicals that pose an “unreasonable risk to health or to the environment.” Examples of TSCA chemicals include Asbestos, Lead-Based Paints, chlorofluorocarbons, and Polychlorinated Biphenyls. The EPA reports that ChemView now has information on close to 10,000 chemicals. To view detailed information on the EPA’s ChemView changes, click here. For information on the EPA’s TSCA, click here. If you're looking for an online solution to help you cross-reference your chemical inventory against a host of local, state, national and international regulatory lists, MSDSonline's HQ RegXR Account has robust tools in place to help you meet your reporting and compliance needs.